Commentary: The Pentagon goes West to be with the cool kids. It should stay home. Privacy, security and one login to rule them all? The National Aeronautics and Space Administration (NASA) is seeking input on drafts of the organization’s technology roadmaps that will shape priorities for the next 20 years. Five years ago, in 2010, NASA developed a set of technology roadmaps to guide space technology developments. This month, NASA released drafts updating and expanding on those fourteen roadmaps. These documents will serve as a foundational piece of the Strategic Technology Investment Plan (STIP), which will lay out a strategy prioritizing technology developments and establishing principles for investment. NASA’s web-based system, TechPort, tracks and analyzes technology investments. Together, the roadmaps, STIP, and TechPort enable portfolio management for NASA’s technology spending, aligning investments and reducing duplication. 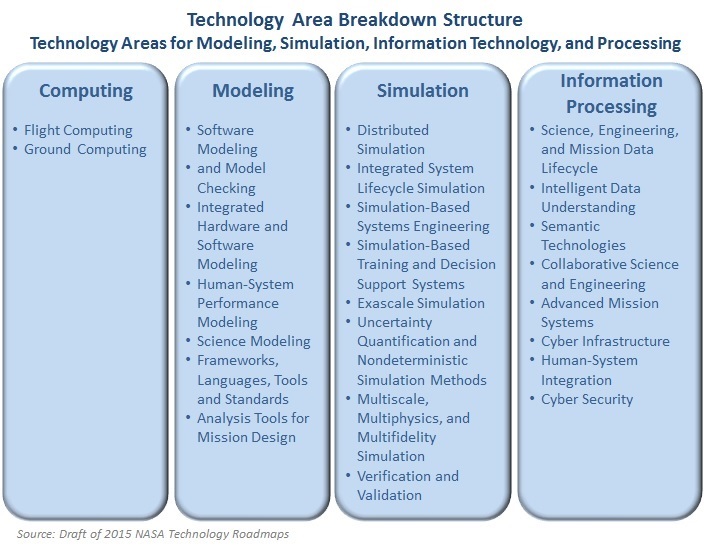 The 2015 NASA Technology Roadmaps cover fifteen Technology Areas. Crosscutting technologies, like avionics, autonomy, information technology, and space weather, span multiple sections. Focusing on applied research and development activities, NASA’s Technology Roadmaps cover a broad set of needed technologies and development approaches for the next 20 years (2015 to 2035). The Modeling, Simulation, Information Technology, and Processing Technology Area highlights advances in flight and ground computing capabilities, physics-based and data-driven modeling, as well as information and data processing frameworks, systems, and standards. The capabilities addressed within this area impact other technologies across the NASA portfolio, enabling application-specific modeling, simulation, and information technologies called out in other roadmaps to support the ever-increasing challenges of NASA missions. Despite parts of the discipline-specific nature of parts of the technology area, many of the capabilities will enable advances in modeling and simulation for areas addressed in other roadmaps, which address specific domain perspectives. The current roadmap continues the pattern of previous versions, listing Modeling and Simulation separately; however, given the high degree of their interrelation, the roadmap contents often reference them together. Goals for the next twenty years include development of transformational flight and ground computing capabilities, increased modeling productivity and fidelity, simulations to enable risk management across the entire system lifecycle, and progress around leveraging NASA’s massive volumes of observational, sensor, simulation, and test data. Ultimately, these capabilities will help to empower decision makers and support NASA’s missions. NASA released a request for information (RFI) on May 11, 2015 associated with the road map drafts. The space agency is looking to determine if the correct state of the art has been identified, gauging interest in space applications from commercial industry and other government agencies, use of technology for non-space applications, and exploring partnerships for technology development. The comment period is open until June 10, 2015. Last week’s American Institute of Architects (AIA) convention brought more than 18,000 attendees from around the globe to the Georgia World Congress Center in Atlanta. The three-day event featured more than 300 educational sessions/workshops and a massive expo with nearly 800 exhibitors. As in years past, Deltek’s presence was in full force at this premier architecture, engineering and construction (AEC) event. In addition to showcasing Deltek solutions on the expo floor, Senior Product Marketing Specialist Megan Miller led a seminar titled “Fall in Love with Business Development Again” to a packed crowd on Thursday afternoon. Alongside Wallace Engineering’s Brad Thurman, PE, FSMPS, CPSM, Miller covered the common pain points identified by business developers and presented tips on how to reengage the industry and win more business. Many attendees reported they simply don’t have enough hours in the day to dedicate to BD, and they often find themselves doing tasks they don’t enjoy, such as cold calling, expense reports, and attending meetings. Thurman and Miller provided several practical tips for spending more time on the tasks you love and blocking time for business development. Miller also touted the importance of being more selective in business development. Statistics show it takes 100 cold calls to get one lead; therefore, companies should narrow their prospect lists and truly nurture that network. Taking the time to learn about a potential client and their needs before approaching them goes a long way in distinguishing your organization from the rest. GovWin IQ offers several solutions to help business developers learn about potential clients and narrow their prospect list in the public sector. GovWin IQ’s Government Snapshots tool combines government data with Deltek’s expert analysis and forecasting tools to provide vendors with key information on spending, population, agency contacts, employment, bids, and more so that they can make informed business decisions in their target markets. GovWin IQ Lead Alerts act as the first hint of a project for business developers. Our analysts are scouring government websites and reviewing state and local capital improvement plans (CIP) on a daily basis to identify new projects across all vertical markets and provide updates on past CIP initiatives. Lead Alerts help you identify projects planned years in advance so you can start building relationships with prospects early. Further, GovWin IQ’s newly expanded contract awards database offers business developers deep insight into current contracts across the state and local market, expiring agreements that may be rebid, as well as bid tabulations/bidders lists offering strong competitive intelligence. Learn more about GovWin IQ solutions with a free trial. On the heels of more than one billion attempts to plant malware on its networks and almost 360 million network intrusion attempts, VA announced a new program office to ramp up cybersecurity readiness. Earlier this week, FedScoop reported that the VA had awarded a new $50M contract to support its Continuous Readiness in Information Security Program (CRISP). In addition, VA has named a senior information security office to head the new CRISP program management office. ASM Research, a wholly owned subsidiary of Accenture Federal Services, will provide CRISP Support Services to VA under a T4 contract task order awarded in April. Stephen Warren, VA CIO, named Dan Galik to lead the new CRISP program management office in an internal memo in March. Galik currently oversees the VA Network and Security Operations Center and has held senior security posts at HHS, IRS, NRC and DISA. In an interview with FedScoop Galick said, “One of my goals is to instill a sense of urgency,” with reference to VA’s security processes. Galik wants to mimic work done at the State Department in establishing security scorecards for its embassies. He would like to develop a security dashboard for the 150 VA medical centers, as well as all VBA regional offices. Galik’s hope is to establish a reporting mechanism that is understandable by VA leadership at each location. “I have to make this complex area understandable,” stated Galik. One of the CRISP program’s objectives is to arm local security managers with information and metrics regarding their own security position, and give them the ability to easily respond to senior official inquiries. The challenge is to establish a security posture that doesn’t inhibit or infringe on patient care. “We don’t want to lock down too much to a degree where they impact patient safety and patient car. So we always have a proper risk management trade-off,” said Galik. Can Wikipedia forecast the flu? Can the government fix citizen services?